If you are in the market for a new vehicle that comes with more than a few safety features, then this years new Mazda3 sedan compact car is one you certainly need to investigate. The Mazda3 has a radar system working to identify a threat of a collision on the road ahead and bring you safely to a stop. When the Pre-Collision Assist system identifies a threat of a crash, the driver is warned by a series of tones and visual alerts, followed by the brakes pre-charging to slow your vehicle to a stop in time. Protruding above the dashboard, the 8.0-inch infotainment system in the CX-9 is packaged with great digital applications. You'll love the MAZDA CONNECT platform that's optimized for the latest versions of iOS and Android. You can easily stream podcasts and other audio channels on Apple CarPlay and Android Auto. 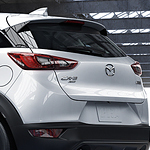 As soon as you decide you want a popular crossover SUV, the Mazda CX-5 should be at the top of your list. We're excited to show you all of the technology features that are included inside of this vehicle. They will provide you with plenty of safety as well as convenience when you are on the roads. A lot of technology has been integrated into the CX-5. You will have lane-keep assist, adaptive front lighting, radar cruise control with stop and go functions, rear cross traffic alerts, blind spot monitoring, and more. For a lot of people, a vehicle that is powerful is something that is worth buying. However, it is important for a vehicle to announce its power. One of the effective ways for a vehicle to give glimpses to its power is through its appearance. We at Hixson Mazda of Alexandria believe that the 2019 Mazda MX-5 Miata is very effective at giving a glimpse at its power. You can enjoy more safety and convenience with the Mazda CX-3. We’re here to show you all of the technology features that you can take advantage of. Mazda prides themselves on offering more features that come standard. It's never an easy process to shop for a new or new-to-you vehicle. There are many different makes and models to consider, and each vehicle you consider will have features that you must consider. Budget is always important. If you are looking for an affordable vehicle that you will be able to trust, come take a look at the Mazda certified pre-owned vehicles that we have on our lot right now. With each vehicle maintained and repaired by our service technicians before going up for sale, you'll feel comfortable investing in one of these options. There's nothing quite comparable to driving down the road on a beautiful day in a convertible. If you're looking for one of these sleek and sporty vehicles, we offer the MX-5 Miata RF for sale at Hixson Mazda of Alexandria. When you're in your vehicle with loved ones, you want to be assured of your safety. In the popular compact sedan, the Mazda3, there are several features that can prevent a collision. Some accidents are unavoidable. Because of this, the Mazda3 sedan has a construction and features that can reduce the severity of the crash. The Mazda3 has i-ACTIVSENSE, which uses radar to scan your surroundings. This technology then sends information to you inside of the vehicle via visual and auditory alerts to tell you of potential accidents. Mazda3 Hatchback: Does Its Design Add Up? 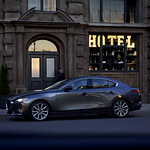 KODO is an interesting word, but it is the word that drives everything that goes into creating a Mazda3 hatchback. It is the design principle that helps keep the vehicles sleek and yet efficient. You can see it in the curves of all of the Mazda3 five-door models. Practical people will appreciate that the back seats of the Mazda3 hatchback can be folded down in order to create more room for storage of various items. A lot of people place their groceries back there after they have been out and about shopping.